There’s no sign of another southerly until the middle of next week, and the guys at Noakes are not free to fit our holding tank until Monday, so we’ve settled down to relax for the remainder of the week. 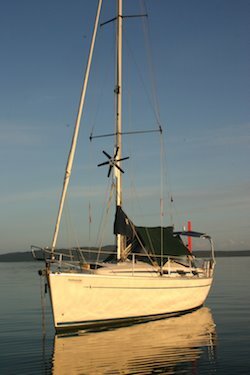 This is no great hardship, because Salamander Bay is a superb and well-protected anchorage. The neighbouring marine sanctuary is packed with life, and every morning the seabirds put on a great display as the bait fish come to the surface. I’m usually sitting in the cockpit each morning for an hour or so after dawn, catching up on email or reading a book or just sitting and thinking. Then I hear the first characteristic fizzing sound, and the surface starts to boil in a circle a few metres across as the fish begin to jump. I can only assume that they are trying to avoid some predator fish circling below. 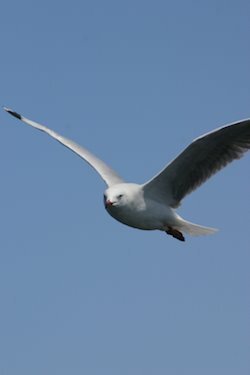 The first gulls arrive; they seem to be able to detect the fizzing from far away. They land inside the circle and try to spear passing fish with their beaks. 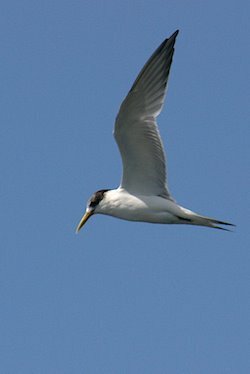 Attracted by the commotion, the first terns arrive, wheeling fifteen to twenty metres above and then folding their wings to plummet into the water with a signature ‘splosh’, returning to the surface a moment later with fish grasped firmly in their bills. If the fish stay active for more than a few minutes, then a stately pelican will drift over before landing in an unsightly flurry of wings and water, losing no time in cruising through the centre of the disturbance with enormous beak agape, scooping up fish by the litre. Then as quickly as it began, the fish boil will stop, and all the birds relax and bob on the surface and wait for the next one.